These long dresses reflects a classy styles. These ladies evening gowns party wear long dress are appreciated by our clients for their perfect fitting and fine finishing. Our offered Ladies Long dress are suitable to be worn on any casual occasions. These long Dresses are made in accordance to offer very attractive look to the western wearer. Nikhaar brings to you a collection of comfortable cotton kurtas that add style to your personality. This kurta has a round neck, three quarter sleeves and a beautiful design in a pink shade in the front and along the hem at the bottom in the front. The elastic stretch at the back provides a comfortable fit. Team this with a pair of white leggings, heeled sandals, simple jewellery and look like a diva. Indo Western Designer Tunics. Our fine and delicate weaved fabrics are tested for the tear strength and shrink Resistance before being designed to perfection. The sophisticated warehousing are necessary for longterm storage and safe delivery to the clients. We offer varied payment mechanism and shipments to reduce cost of final good. Be ready to set hearts aflutter with this white kurta from Nikhaar. 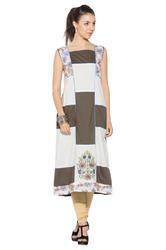 This white cotton kurta features a V shaped neckline with an elaborate pattern in maroon and a curved hem. Team this with black leggings and heeled sandals and experience comfort at its best. 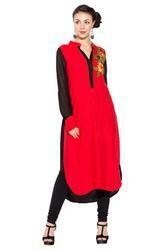 Upscale your fashion quotient with this gorgeous red cotton kurta from Nikhaar. This dress in a red hue in the front and complimenting black shade in a tail pattern at the back displays V shaped neck and full sleeves. Team this with a pair of black leggings, heeled sandals and fashionable danglers to complete the classy look. We offer wide variety of exclusive Designer Kurtis/Tunics to suit the personality of the individual.It is a perfect choice to be wear on formal as well as informal occasions.Our Kurtis fabricated using superior quality cotton fabric, it provides maximum comfort with a distinguished look.